Chocolate Coffee Cheesecake. Who doesn’t like chocolate and coffee together? 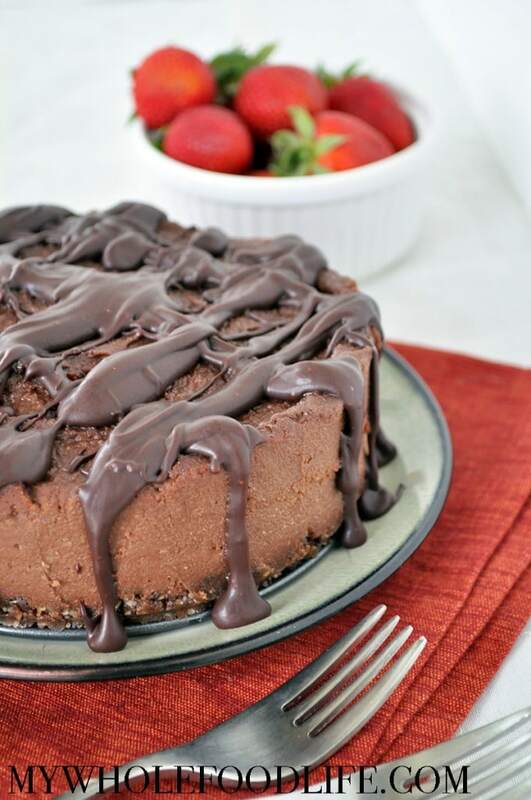 If you love them both, then you will LOVE this chocolate coffee vegan cheesecake. It has 3 levels of chocolate for the chocolate lover in your life. In my case, the chocolate lover is my husband and I think he is going to devour this! If you also love chocolate and coffee, you will love my chocolate coffee overnight oats and my flourless brownie bites. This decadent and indulgent cheesecake is completely dairy free! It’s also vegan, gluten free and paleo approved. A must make for chocolate lovers! You can also use mini muffin tins to make individual portions. They freeze very well, so you can stash some way back in your freezer when you want a sweet treat. The perfect dessert for chocolate lovers! In a food processor, mix all 3 ingredients for the crust. If the mixture looks a little dry, you can add a small amount of water to get it to come together. I did not have to do this. Grease a 6 inch spring form pan . Press the mixture into the bottom of the pan and place in the fridge. Drain the cashews. For the cheesecake, add all the ingredients in a food processor and blend until smooth. Pour this mixture into the 6 inch spring form pan and place in the fridge to set. This may take 1-2 hours. Once the cheesecake is set, use a double boiler method to melt the chocolate chips and milk. Remove the sides of the spring form pan and drizzle the chocolate over the cheesecake. Serve immediately or refrigerate for later. Wow Melissa, this looks decadent. (And I'm not even the chocolate-lover in my house). :) BTW< the cookie recipe from a few posts ago also look delish! Hi Melissa! I'm a long time subscriber to your blog and my family has loved everything I've made from here!!! Quick question on this recipe, would you say the crust is crunchy or on the soft side? I always like a contrast in texture to creamy desserts. I wasn't sure if the dates made it soft even though the nuts are crunchy. Also, I don't own a 6 inch springform pan and don't want to buy one for one recipe. Any suggestions on what else would work? Thanks so much for the feedback! Hi Holly! Thank you! You can make this in an 8x8 baking dish too. It will just be more like cheesecake bars instead of a "cake." I think the crust is on the softer side. I bet if you liked more crunchy crust, you can probably make it with nuts, coconut oil and maple syrup? Instead of the dates? Awesome..Thanks Melissa. Love the new video I received in my inbox today...honey almonds! YUM!!! Shut the front door! I am so making this for my husband! Thank you! Thank you! Thank you! From the bottom of my gluten free heart! Ha! I so want to make this right now, but don't have any coffee extract. What do you think about soaking my cashews in coffee? Hmmmm. I'd have to say soaking the cashews in coffee was a success. It might have been a more subtle flavor than the extract, but you could definitely taste it. I didn't have a 6 in. spring form pan either so I made it in a 8 in. round cake pan lined with parchment paper which allowed it to be easily lifted out. The finished height was 1 in. for those wondering when making in a larger pan. Tasted great. Decadent dessert, but not overly sweet tasting. I ended up only making a half batch for the topping and didn't even use all of it. A few chopped pecans on top added a nice crunch. Thank you for letting me know Beth! Glad you liked it. This definitely looks like a chocolate heaven! I don't have any raw nuts, I'm wondering if a nut butter would work the same? IF you think it would work, do you think I should go with the same 2 1/2 C measurement?